The Logic Smoke Premium Kit is a small and realistic Starter pack. 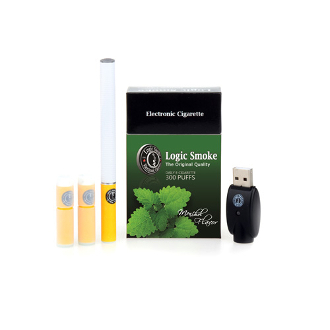 The Logic Smoke kit includes one 180 white automatic battery and 3 Menthol 11mg orange cartomizers. The combination of the two make for a classic cigarette appearance while maintaining a light and portable device. The Logic Smoke Premium kit is 510 threaded and comes in a Menthol flavor for those who enjoy the cooling taste it has to offer. This e cigarette is rechargeable and comes with its own usb charger that can fit into any usb outlet for a quick charge!